Learn how to upload, activate and delete content in Zunos! Anything that you are able to create or build in Zunos, can be done from within Drive. This includes form layouts, message templates, quizzes, courses and achievements. Use the Add Content option in Drive to create a folder, web page link, form, quiz, message templates, achievements, New Dashboards, Courses or import quizzes using the Zunos quiz template. To create any of this content simply click on the item in the dropdown list. When you create a form, quiz, message template or achievement group a window will open allowing you to build, edit and save the item of content. To help organize your content created, folders will only appear in the Zunos App if a media/content file (PDF, Video etc) is added to the folder. Folders can be created with forms, message templates and quizzes and the folder will not appear in the Zunos App. You can enable the selected content only or enable all content within the selected folder. Enable means to make the content/ folders visible to your users. You can disable the selected content only or disable all content within the selected folder. Disable means to make the content/ folders invisible to your users. You can delete the selected content only or delete all selected and all linked content. Delete means to permanently remove the content/ folders from your account which will remove all data in reports. Copy to Clipboard - Creates and stores a copy of the content which can be , using paste copied content within a specific folder. Content can be copied from Libraries and Live Content but can only be pasted in Live Content of the organization is was copied from. Copy to Profile - Copy content to an organization you have admin privileges for. Copy to Child Organization - Creates a copy of the selected content within the selected child organizations Live Content. 5. Paste Copied Content: Once the file or content folder has been selected to "Copy", use the Paste Copied Content option key to paste your content. 6. Notify Users About this Content: This option key will notify and send a message to users, which will include a link to the exact content file from the Communicate area in Zunos. 7. Copy Shareable Link: Creates a link of the content file that can be pasted into a message or notification for users to click on and be directed to the content. Note: Copying a Message Template from clipboard will cause a blue chain icon to appear next to the Message Template to show all copies are linked. Any changes made to one Template will affect all linked Templates. 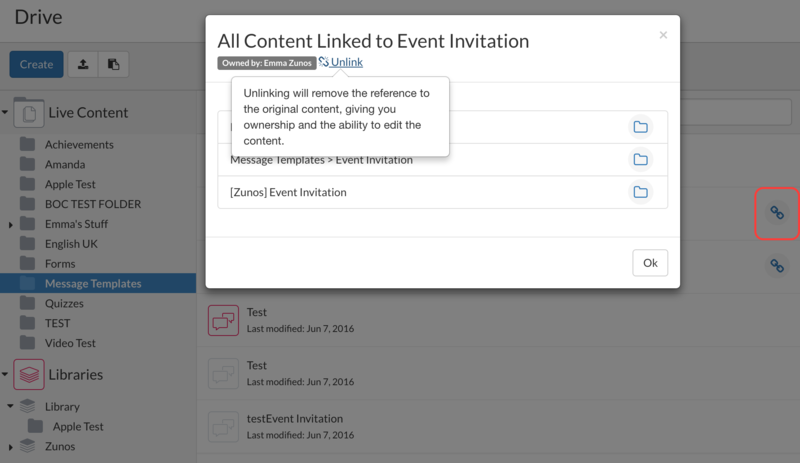 The Message Templates can be unlinked by clicking on the blue chain and selecting unlink. See image below.